The main pitfall in training is to focus on the effects rather than searching for, and changing, the causes. 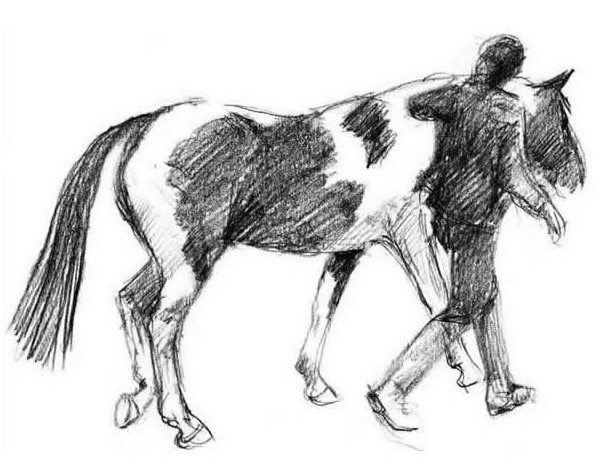 Without knowing why your horse is behaving in a certain way, any proposed solution will at best be educated guesswork. A solution that is effective for one bucking horse may be totally inappropriate and ineffective for another horse if he is bucking for a different reason. To illustrate this, an example that most of us can relate to is when your horse refuses to load in his trailer. All too often, you are quickly overwhelmed by people offering advice and even trying to take over and load the horse. The vast majority of these people will give advice along the lines of ‘the best thing to do when a horse refuses to load is.....’. This is a classic example of focusing on the effects (in this case the ‘effect’ is a refusal to load) and not the causes. There is no ‘best way’ to help a horse to load into a trailer - the solution depends on the cause of the problem - why is he refusing to load? Maybe he believes that staying out and eating the particularly tasty grass around the trailer is a better option, or he has learned that when he plants at the bottom of the ramp, people magically appear with lots of appetising food and give him lots of attention. Or, possibly, he genuinely thinks that the small, dark box you are trying to coax him into is a very scary place. In all these cases, the solution is quite different, and taking the wrong approach may do more harm than good. For example, trying to force a scared horse into a trailer is dangerous for both you and the horse, disregards the horses welfare, and is likely, even if successful on one occasion, to make the problem worse in the long term. We also get the second type of advice, where the person offering the advice has some knowledge of horse behaviour, sees an obvious ‘cause’, and proposes a solution based on this cause without looking at the whole picture in enough detail - a little knowledge is a dangerous thing, and such people can be very convincing! They may tell you, for example, that your horse is ‘dominant’ and advise you on how to deal with this. I saw an example of this some time ago, where a very bossy, pushy mare was refusing to load into a trailer. The ‘dominant’ behaviour had been identified, but the problem was getting worse, not better, and her owner had a broken nose and several other minor injuries as proof of this! A more detailed look at the mare’s behaviour clearly showed that she was afraid of going into the trailer, and once the fear issue was addressed appropriately, in addition to some handling advice to deal with her pushy behaviour, the issue was resolved. The first behaviour ‘expert’ had simply picked up the most obvious possible cause, and had not considered any other causes. It can be hard to say no when some overbearing horsey person who seems much more experienced than you is insisting they have a fool-proof solution, or it may be tempting to look for a quick fix with a ‘try it and see’ approach, but the risks are significant. For your safety, the safety and welfare of your horse, and to actually get the problem fixed it is really best to properly identify and address the root causes of any unwanted behaviour.